Yes, you read it correctly. I did just quote Jay-Z. Wondering how this will help your content marketing strategy? I can explain. Besides being one of the princes of hip-hop, Jay-Z is a full or part owner of more than 20 businesses including Roc Nation Record Label, Translation Advertising, Tidal Music Streaming Service and the Brooklyn Nets. The hip-hop mogul has an estimated net worth of $550 million, according to Forbes. So, he might just have a point. Not only is he a recording artist, he’s generated a massive following, high profits and a commanding brand image. What can we learn from the marketing strategy of musicians? They infiltrate our magazines, newspapers, social media feeds, television, conversation and headphones. Behind this popularity lies some serious marketing savvy which we can learn a lot from. Let’s take a look at four major artists and the marketing moves they’ve made to achieve international stardom. Beyoncé’s success speaks for itself. Whether you listen to her songs, watch a video, read an article, admire her outfits, see a performance, follow her on social media or belt out her lyrics at karaoke, her face seems to pop up everywhere. She has a history of smart marketing, but the surprise launch of her fifth album in 2015 was genius. Beyoncé’s dedication to putting out a high volume of multi-platform content set her apart. Case in point: The 14-track album was accompanied by 17 videos, a four-minute trailer (which received 7 million views) for her upcoming tour and constant updates across social media outlets. Not just a musician now, is she? That’s clear business marketing territory. 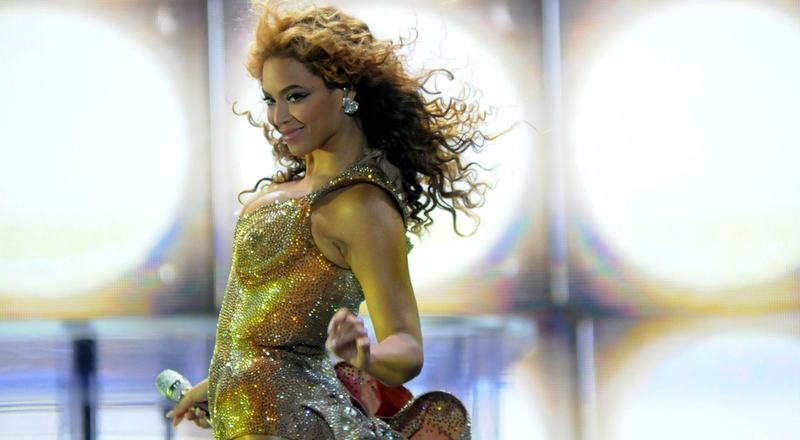 Be the new Queen B and over-deliver on a variety of engaging, quality material. Step outside of the everyday with a trailer, song or merchandise. Then, add such trusty reliables as social media posts, television and poster ads and feature articles. The quality of the content will spark excitement while the high volume provides for the consistent engagement that keeps your brand on people’s minds. When it comes to content marketing, there better be space for a second queen. In 2013, Lorde became the youngest number one artist on the U.S. billboard charts in 25 years, and she catapulted to Grammy Award-winner success one year later at age 17. Besides her obvious talent, you can credit her success to some seriously strategic timing. Meanwhile, a Lorde frenzy ensued. “FOR THE LOVE OF GOD, I NEED MORE LORDE,” they would cry in the streets. So when her album finally released and her marketing efforts came in full force, her audiences ate it up. And now she’s an international star. The excitement and anticipation generated by the release of that first track was pivotal to the effective reception of the remaining content. Research where your audience can be found. 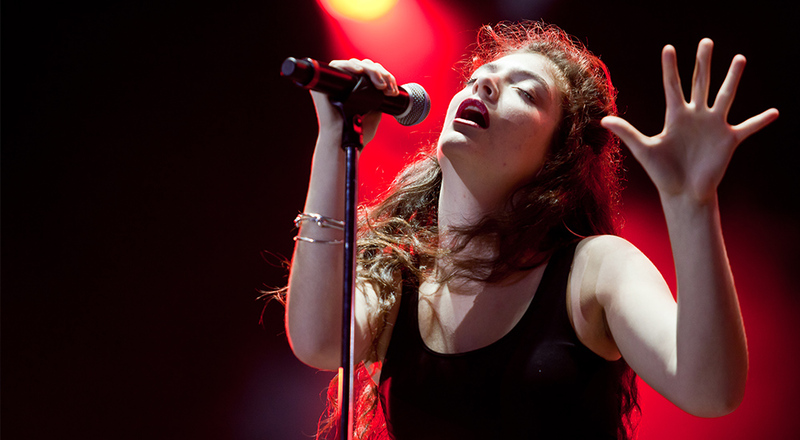 Lorde used social media and Spotify to reach people, as this is where her young, pop-loving target market hung out. Fill the gap in the market. 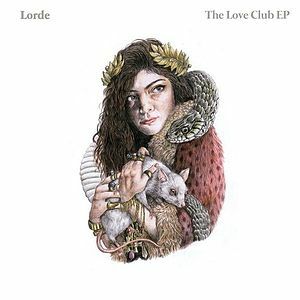 By releasing “Royals” for free, Lorde set herself up as a musician focused on her art in a market where pop stars are often criticized for being too commercial. Why follow the norm when you can lead the norm? 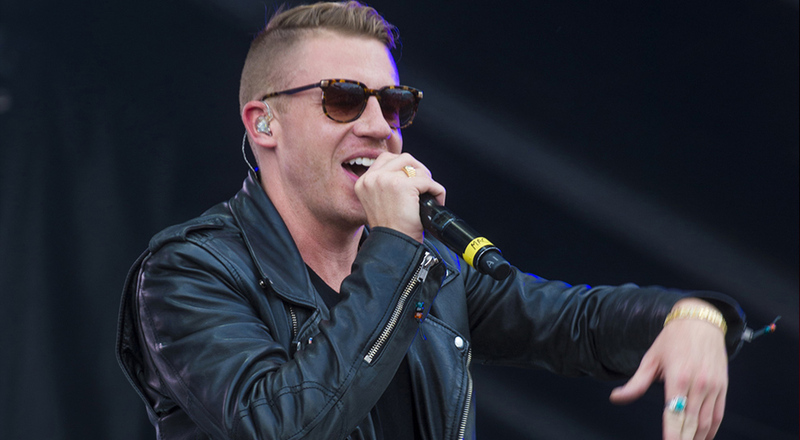 Macklemore doesn’t fit into the traditional hip-hop artist mold, but it turns out that’s why he is so popular. His number one song “Thrift Shop” discarded the high fashion trends of the music industry and adopted the classic op-shop look. Often seen in old-style fur coats, the rapper made the style cool again, and attached it to his growing brand. Coming up with ideas for content that will generate buzz can be difficult. While incorporating current trends is a great marketing technique, Macklemore’s strategy involved breathing new life into an old idea. His focus on originality continued in the song “Same Love,” which explored homophobia and gay rights — uncommon subjects in hip-hop. Four Grammys later, and the idea of finding good ideas in unexpected places is a winner. Explore old trends that can be revived. Look for topics that people are passionate about but need more media attention. Take inspiration from everyday activities or items that everyone can relate to. Who knows, with the right campaign, your company could start a new social discussion or even make MC Hammer pants stylish again (please don’t). First thought when I saw this Twitter post: Skrillex, this is a bit weird and unnecessary. How does this attract or keep a following? Second thought: Hold on. 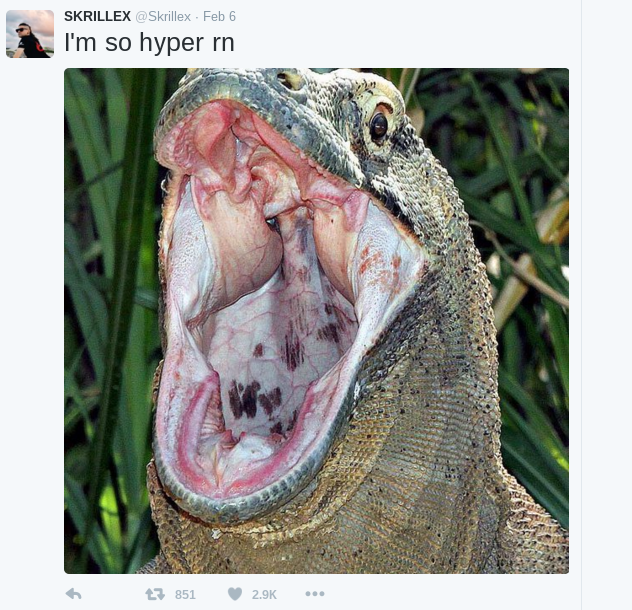 I feel kind of hyper right now, too. Skrillex and I have things in common. I wonder what else we have in common. Ahh, now I get it. Social media is the perfect platform for public figures and brands to relate to their audiences on a personal level. However, leveraging this transparency is a skill. 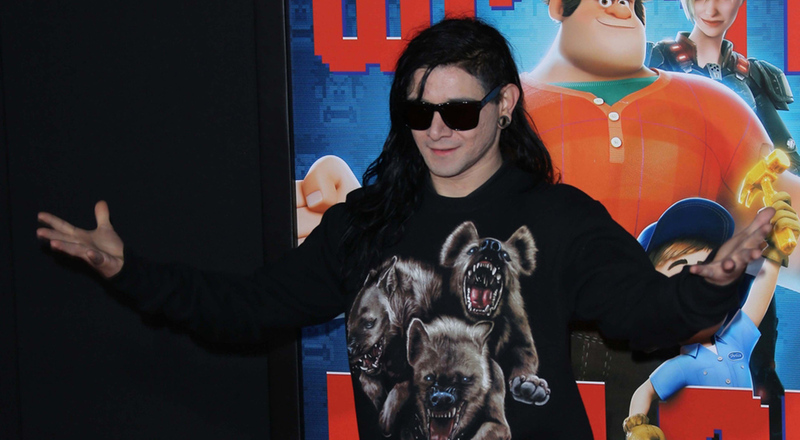 Skrillex’s Twitter bio simply reads “your friend” — a perfect summation of his strategy. By tweeting his daily thoughts, quirky jokes and some completely random insights, followers get to know the person behind the turntable. And seeing him as another friend often ignites more passion for his music. It’s no surprise, then, that he consecutively sells out shows. Still not convinced? Then think about your personal social media accounts. Would you still follow someone who constantly self-promoted and wanted something from you? Probably not. Your company’s audience alike, may get bored of blatant advertising. As a business, social media is an easy way to inform customers of new products and promotions. But try interlinking that with some personable updates. Share your opinion on current news, a funny story from the office or a picture from last night’s staff party. An authentic, fun brand personality vs. ordinary self-promotion. How do you want your brand to be described? Music is a source of relaxation, a way to stir emotions and a necessity at every party and road trip. It’s a job for some and a passion for many. And now, with these tips, it can be the inspiration for successful content marketing. Naomi Bagga is a regular contributor to the ClearVoice blog. She studied public relations and advertising at the University of New South Wales, Sydney, and recently completed a semester abroad at Northern Arizona University in Flagstaff. She is passionate about how the digital era is changing the way we engage in business and media, and she loves music, photography, travel and a good cup of coffee. Follow her on Instagram.